Quit paying so much money to the cable companies! Join the revolution and stream directly to your television. It's practically free and you can choose what you want to watch instantly instead of being limited to what the cable company dictates (or just another episode of Law and Order if it's TNT). 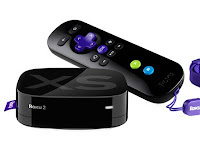 1SaleaDay.com is offering this Roku HD Streaming Video Player for just $50 + FREE shipping (reg. $100). Instantly stream over 100,000 movies and TV shows from Netflix, Amazon Instant Video, Hulu Plus and more. Listen to music on Pandora, or listen to your own iTunes playlists. Watch major sports, news, or original Internet programming. It comes with an enhanced remote with motion control for games and FREE full edition of Angry Birds game. It’s also really easy to install (no computer required). Click here to view the deal at 1SaleaDay.com.